In this day and age of golf technology more and more improved golf clubs, golf balls and accessories are becoming available every single day. The same holds true for golf swing training aids. Golf swing training aids can be a good thing and not one is necessarily better than the other. 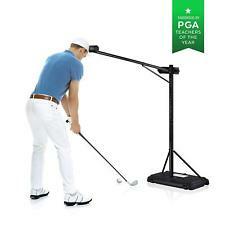 More golf swing training aids are becoming available to the golf world every single day. Most of the top golf training aids can really help a particular area of your swing but you need to know what your main problem is with your golf swing before choosing a golf swing training aid that might be right for you. Don’t be misled here, a certain golf training aid can significantly help your golf swing and your golf score but is not going to happen overnight. Just like anything it will take a lot of dedication and a faithful commitment for anything new to help you. Below I am going to introduce you to some of the best golf training aids available to all golfers today. I mention this golf swing training aid first because it is my favorite. If, you want to perfect your golf swing you really do need to check out the Medicus golf swing trainer. The medicus swing trainer is a dual hinge golf club trainer in a driver or a 5 iron. The objective of the medicus swing aid is to allow you to make a perfect swing plain on a consistent basis. From your setup to your back swing and all the way to your downswing and through impact if you do not make a perfect swing all the way through one of the two hinges built into the club will break down. If, you want to improve your golf swing and your strength at the same time then you might want to check out the amazing assist swing trainer. It is pretty much like getting a free golf lesson. The amazing assist trainer club has a weighted head and a bent shaft that will teach you the correct hand action you need to have in order to create a consistent golf swing. This trainer will also improve your muscle memory, which is so important in hitting consistently. It will also help in your weight transfer as well as your tempo and the timing of your swing. When this club is swung the release is exaggerated which will eliminate your slice and improve your club head speed. 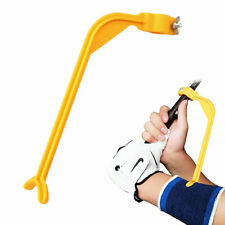 The assist swing trainer club also comes with a built in swing trainer grip. This assures that you always have the proper grip with the V’s of your thumb and index fingers always pointing in the proper position. The trainer can be used at home or on the range. It is perfect for pre-round warm ups. It is available for both men and women and can be purchased right here. One of golf’s great misnomers is that you must keep your left arm perfectly straight in order to create the perfect golf swing. This is somewhat true but necessarily totally true. What you want to do is keep your left arm as straight as it is comfortable to you. Yes, keeping your left arm as straight as possible will create a much wider swing arc which in return will create more club head speed and more distance. If your elbow breaks down the tac-tic elbow will click letting you know where in your swing some adjustments need to be made. 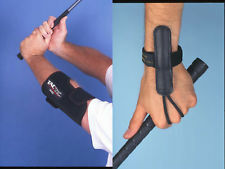 The tac-tic elbow trainer can also let you when you are doing something right in your golf swing. Probably one of the original golf training aids today is the speed stik. It has been around as long as can remember. The fact that it still around must say something for the product itself. What determines how far a golf ball is hit? It is led to believe it is club head speed. This fact has been proven to be true. If, you want to hit the golf ball farther you will need to increase your club head speed, improve your body’s balance and keep your golf club on a consistent swing plane. So what does the speed stik do exactly? The speed stik is exactly what it say’s it is. It is a stik, but not just any stik. Upon using your speed stik you want to swing it in a pendulum motion back and forth about a foot off the ground. At first start out slowly and increase your speed as you go. Now and then check your speeds miles per hour and see how it increases. For every one mile per our you can swing your golf club you will increase your driving distance by 3 yards or more. This is one of the reasons the speed stik has been around so long, it has proven to work. For more information on the speed stik click here. If, you want to get the feeling of hitting the ball properly every time you should check out practicing your golf swing with an impact ball. The impact ball is very easy to use and to understand. Especially if you are a recreational golfer or a beginner golfer chances are you have swing faults like your elbows flying out or you try to scoop the ball as apposed to making solid contact with the ball then the impact ball maybe just the golf swing trainer you need. How does the impact ball work? It is quite simple. The impact is multi-colored to start. You place the impact ball between your forearms from address all the way thru your follow thru. Your only thought here should be to have the ball change colors as you go into the impact zone. 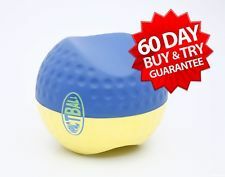 The impact ball can help you to improve every aspect of your golf game from driving. Long irons, short irons, chipping and pitching and yes, even putting. You can use the impact ball anywhere, whether at home or on the range or even at the office. If you have a problem with getting your wrists in the proper position at the top of your back swing this aid could be just what you need. It keeps your club face square throughout your swing, leading to more distance and accuracy, which will lead to lower scores. 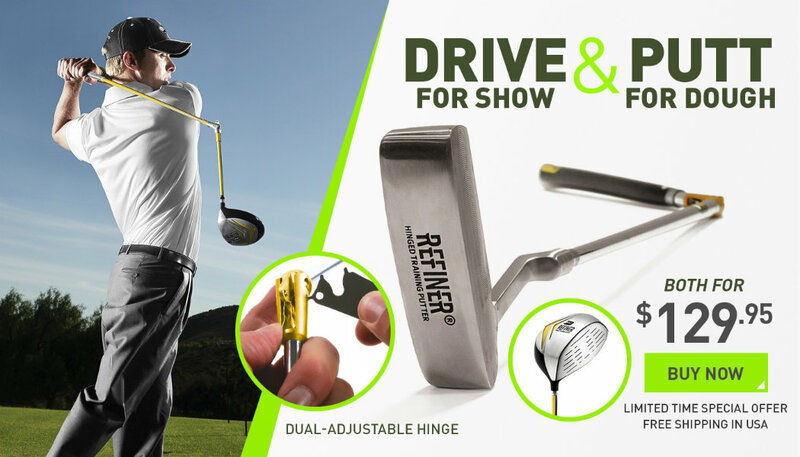 This is the perfect training aid for the driving range for men, women and juniors. You can also actually hit golf balls with it on. This golf training review depicts some of the best golf training aids available in the golf world today. Please remember that not every one of them may be for you. You need to go out to the range or just judge by your play on the golf course and decide what area of your golf swing needs the most work. Once you have determined this then you can check into what might be the best training aid that will help the weakest part of your golf game. 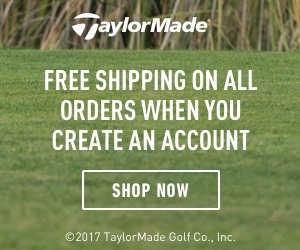 If, you can determine this than I’m sure that any given training aid can certainly help you cut strokes off your score. If, you have found this article useful and helpful in educating you in the use of golf swing training aids then please feel free to leave a comment below. Your input would be very much appreciated. Not too long ago I just couldn’t hit the golf ball straight, I was all over the place, one shot was a big slice then the next shot I would hook into the woods or something. 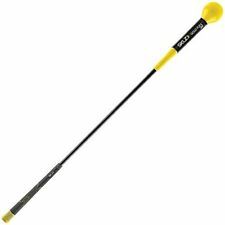 I just could not figure it out, then one day a buddy of mine I was playing mentioned to me this training club he was told about and he went out and purchased it and it turned out to be the Medicus golf swing training aid. I was watching him hit his shots and was amazed how good he was hitting the ball. I promptly went out and bought the Medicus and well, the rest is history. and after time you sometimes forget what the instructor told you and fall right back into your old swing habits, but with the Medicus golf swing trainer you will have it forever and for the less than the price of one golf lesson. I am a believer in this product and I know many others who also love their Medicus swing trainer. 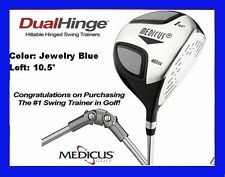 So for less than the price of one golf lesson go here and get yourself the Medicus Swing Trainer. If you have enjoyed my review of the Medicus Swing Trainer please feel free to leave a review of your own or a comment below.